Fast tempos, heavy riffs, clean solos and aggressive musicianship are keywords when their music is described. You will find it all the Metallica tabs below. They started to get a following from day one and saw the commercial top in 1991 when they achieved substantial success with their the fifth album known as The Black Album. The band has sold more than 100 million records worldwide. In June 2003, Metallica's eighth studio album, St. Anger drew mixed reactions from critics as there were no guitar solos. 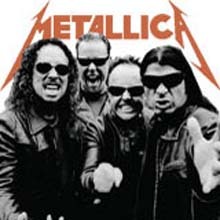 The band has, as you can see in the Metallica tabs below, since gone back to the formula of long solos on albums.